As I don't have an oven, I have been on the lookout for a way to cook stews etc on low slow heat. 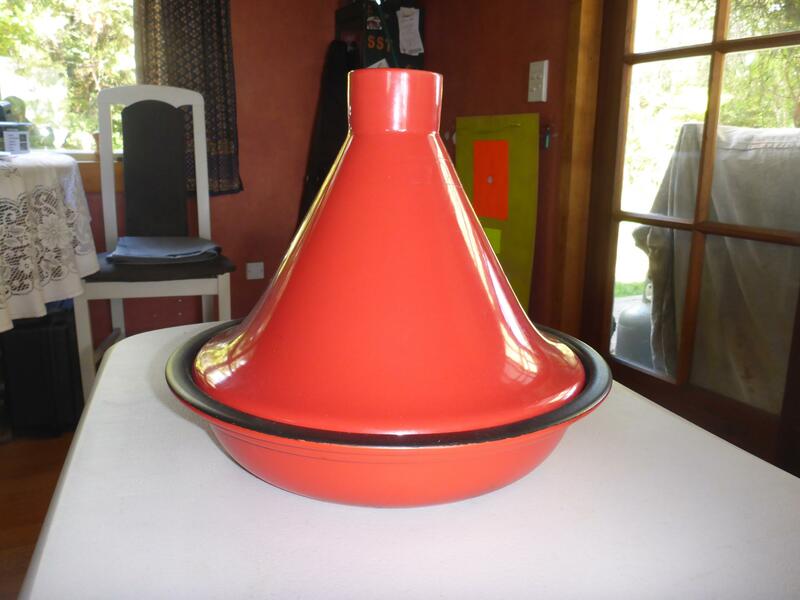 My sis suggested I try a Tagine, so when I found a Maxwell Williams one in new condition at the local op shop for $15 I thought I would give it a go. First try out on top of my wood burner was a Venison stew, cooked for aprox 3 hours. It retained a heap of moisture and was by far my best effort to date. Goat curry tonight, using the same method. P38, veitnamcam, madjon_ and 4 others like this. I was thinking they should be green? the curry might sort that? Those tangines are bloody great for cooking stews and casseroles. I use a cast iron Dutch oven on our wood burner to cook stews, casseroles, soups and sometimes bread. One of my all time fave adds. Carrying Water . . . . . what's your prefered method? Fave Ipod song to pump you up in the gym!.